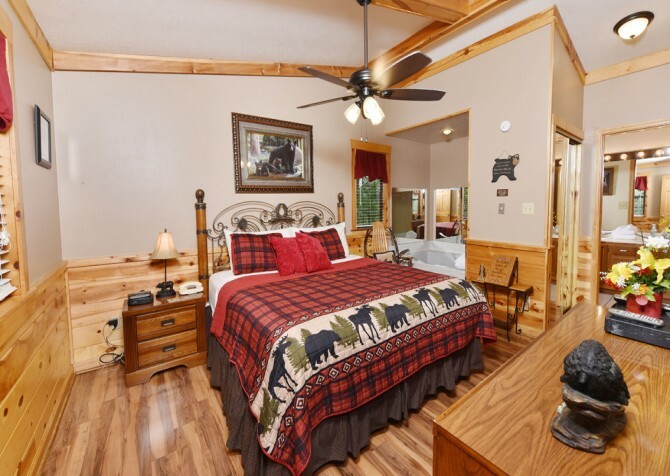 A pet-friendly Pigeon Forge cabin fit for a couples' retreat or a family getaway, Bear End features 2 master suites, 2 bathrooms, and room for 6 guests. Guests can sit among the trees on the porch swing, cook homemade meals in the full kitchen, rest in the cozy bedrooms, stay warm by the wood-burning fireplace, or sit back on nice nights on the lovely covered deck. 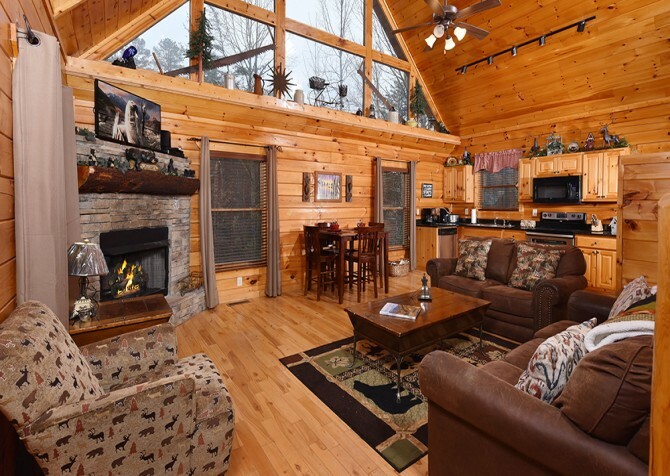 With cozy indoor and outdoor spaces, this Smoky Mountain cabin will feel like a home away from home in the mountains. 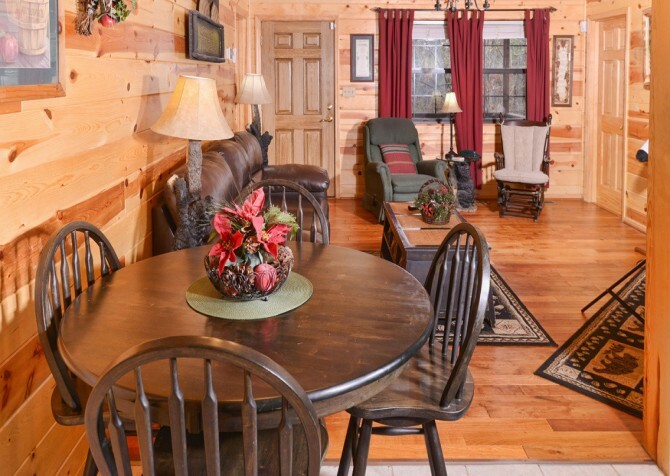 Make memories that will last a lifetime in this cozy Pigeon Forge escape. Black bears are the theme of this lovely living space, with throw pillows, a rug, a lamp, art, and figurines all complementing each other. There is even a large black bear figure that stands a few feet tall! The wood-burning fireplace keeps the room cozy and warm as you sit on the beautiful leather sofa and oversized chair with ottoman. 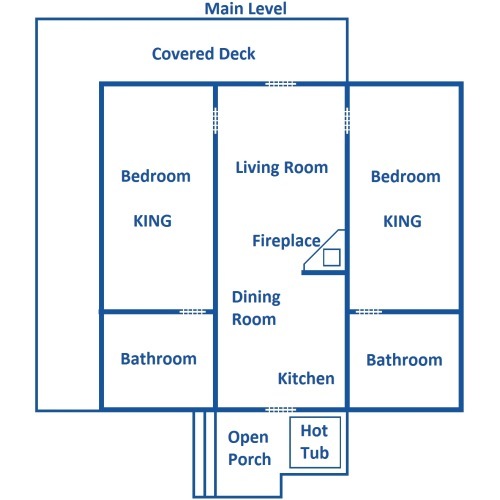 There is also a glider for additional seating, a nice coffee table where you can keep snacks and drinks, and a TV that hangs above the fireplace. 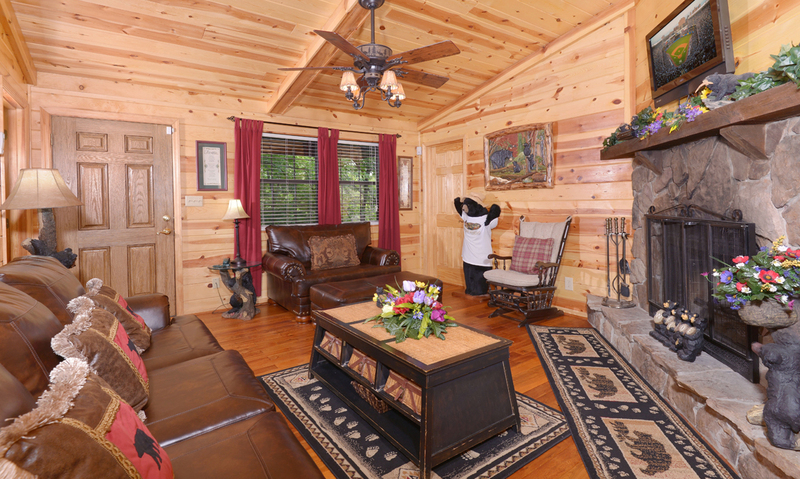 This inviting room will be the heartbeat of the cabin – where family and friends can gather and visit. 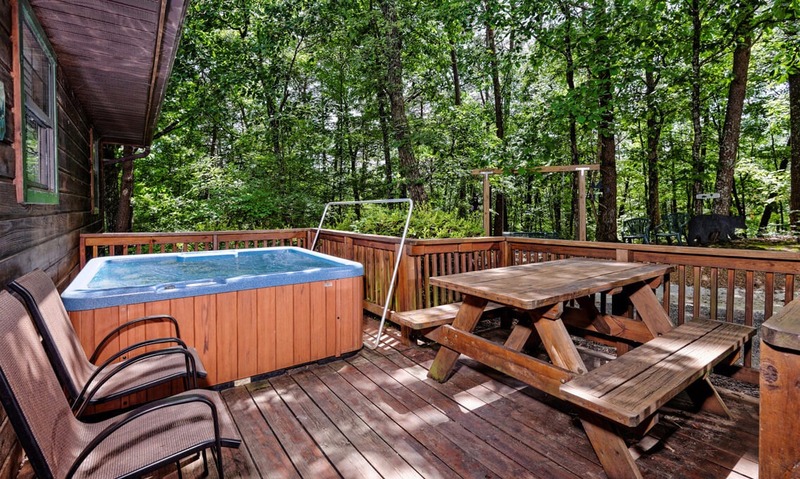 Year-round, you'll find that it's a comfortable place to relax. In summer, keep cool on the leather sofas. In fall and winter, curl up by the fire with a blanket and a good book. 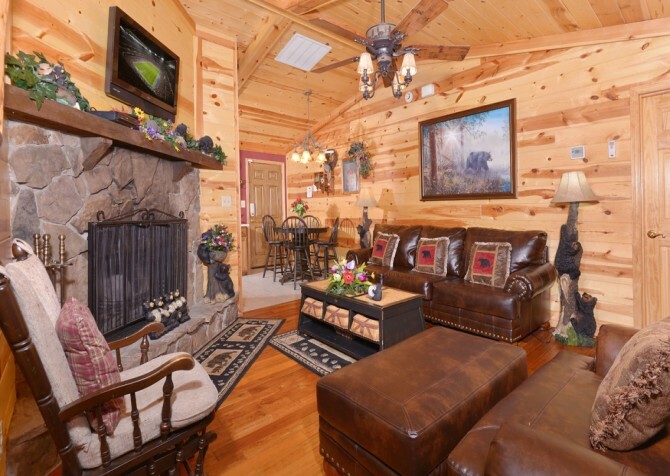 Take some time to enjoy the peace of the mountains as you sip a glass of wine and watch TV. 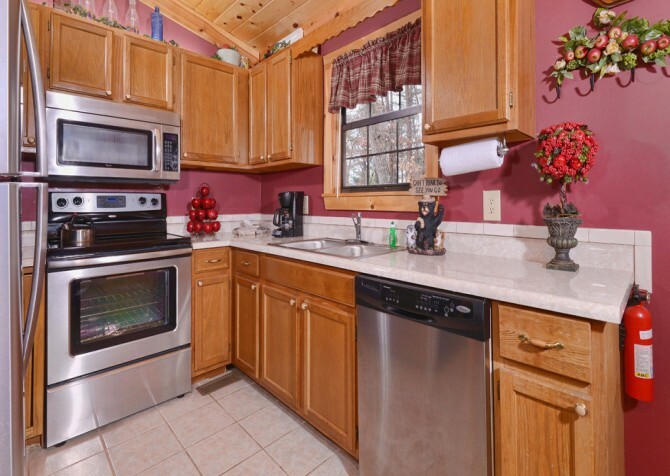 Spend some time cooking homemade meals in the inviting kitchen of Bear End. It's well equipped with plenty of cabinet space, counter space to prepare meals, and stainless-steel appliances, including a refrigerator, microwave, oven, and dishwasher. 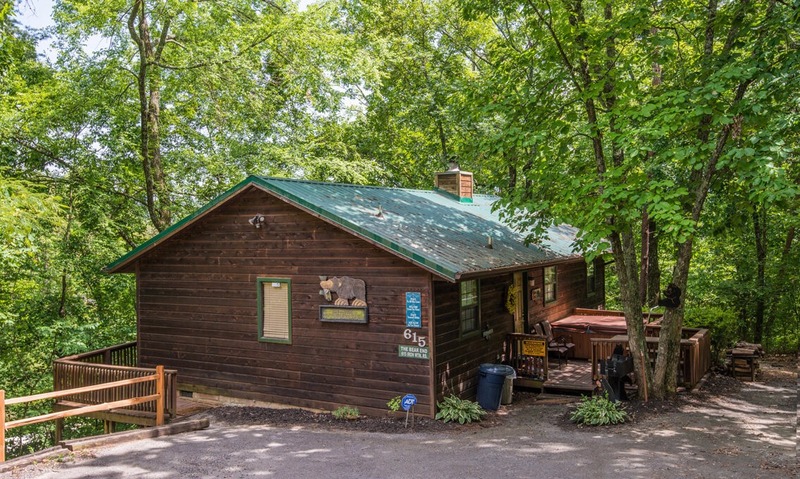 You can save a little money by cooking some meals in the cabin. 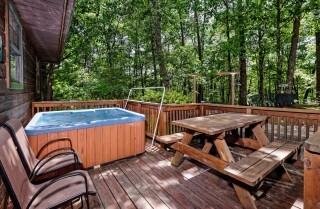 Bake some fresh chocolate chip cookies, make some sides to go with the steaks you cook on the charcoal grill, or just whip up some quick snacks to enjoy while you're hanging out around the cabin. 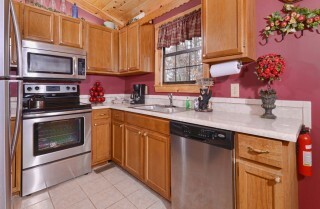 Cooking in the cabin also allows you to skip the long waits at restaurants. If you're traveling as a couple, order a romantic candlelit dinner. 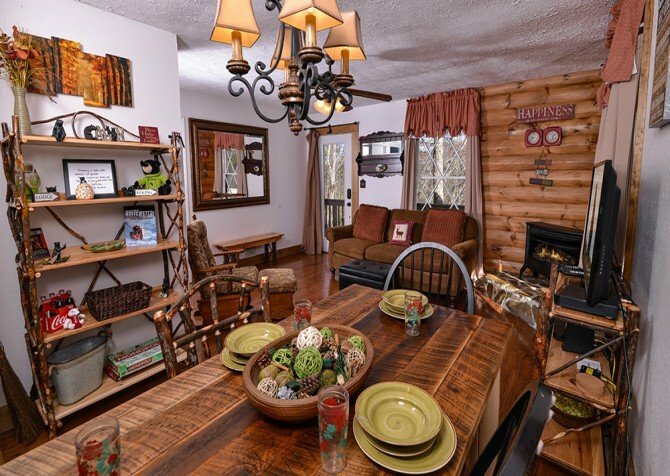 We'll have all the ingredients ready and waiting for you in the cabin, including candles, steak, baked potatoes, rolls, and salad. A round dining table in the kitchen provides a nice spot for family meals. It has high chairs and room for 4 to sit down for dinner. 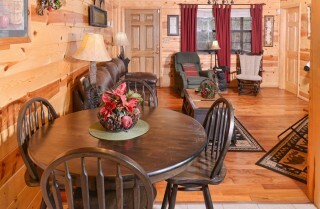 It's open to the living area, so you can visit with others as you dine or enjoy a cup of coffee in the morning. The dark wood of the table and chairs adds a touch of elegance to the cozy kitchen. On game day, use the kitchen to put out a spread of all your favorite snacks. Just steps from the living area, it will be a convenient place to go to during commercials. Located off the living area, this master suite is luxurious and comfortable. 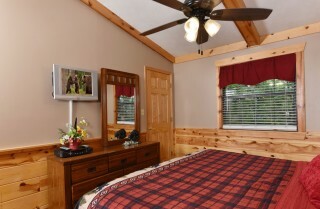 Couples will enjoy peaceful nights here. 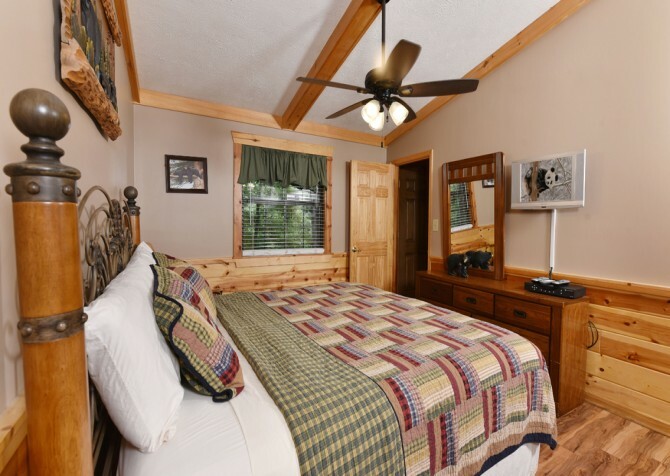 A comfortable quilt is spread over the king-size bed, and natural wood trim adds charm to the room. The bed features detailed scroll work, and a rustic rocking chair sits between the bed and the indoor jetted tub. As you lie in bed, look out the windows at the peaceful wooded views and enjoy being away from it all. 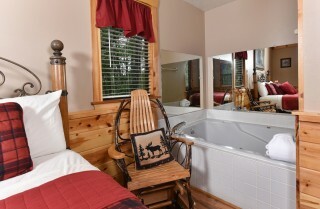 Or you can step into the jetted tub next to your bed for a relaxing bath. It's tucked in a little alcove and has mirrors surrounding it. Browse our gift baskets to find something special to add to your vacation. They are packed full of great items, including bath salts, candles, candy, and lotions. This bedroom offers its own TV, so you can watch movies in bed. As a master suite, this bedroom also features a connected bathroom. A second master suite, this bedroom also features a king-size bed with comfortable quilt and detailed scroll work. The nightstand has a lamp and alarm lock for your convenience, and a rustic rocking chair in the corner is a nice spot to read a good book. 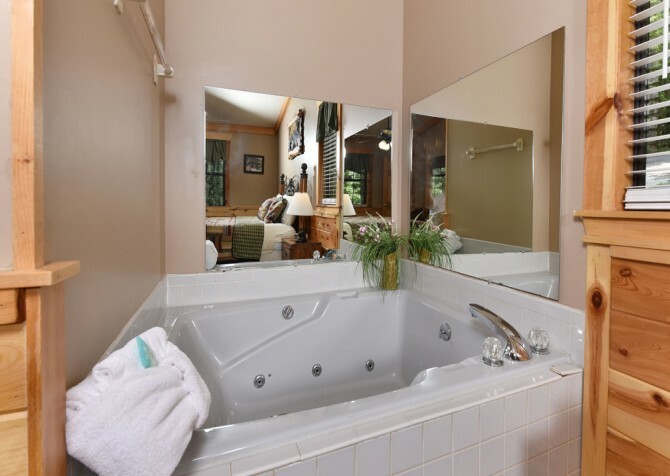 You can unpack your things in the dresser with a mirror, or you can end your night with a relaxing bath in the jetted tub by your bed. 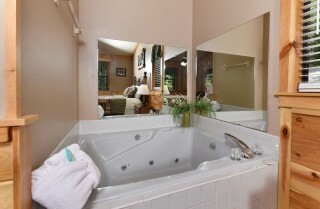 Mirrors surrounding the jetted tub area really open up the space. Then you can step into your private bathroom to get ready before falling asleep in your own little escape. If you enjoy watching late-night shows, flip on the TV and watch from bed. This great space will make you want to head to bed early and sleep in late. 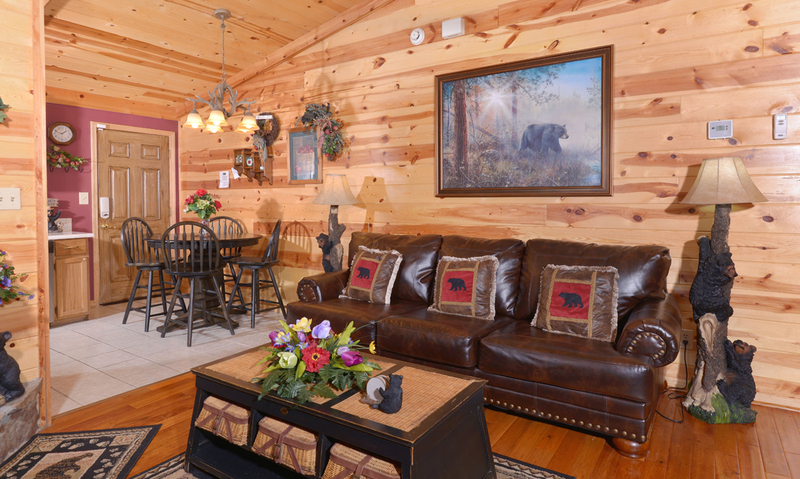 Don't miss out on time in the great outdoors during your stay at Bear End. 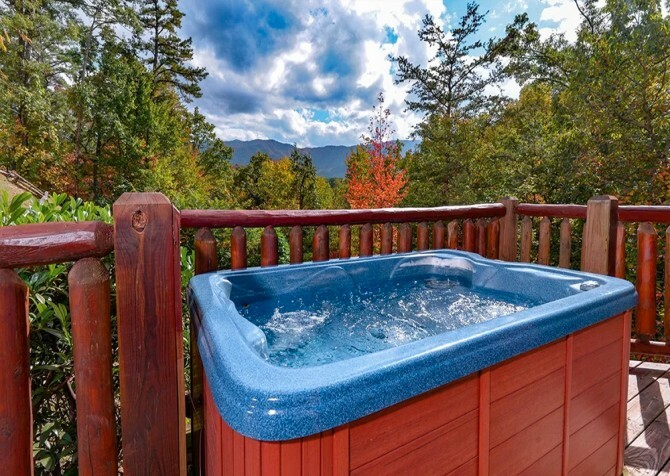 After a busy day of hiking in the Great Smoky Mountains National Park, playing at Dollywood, or exploring the Parkway, unwind in the hot tub on the deck. As you take in the wooded views and sit under the stars, your worries will melt away. 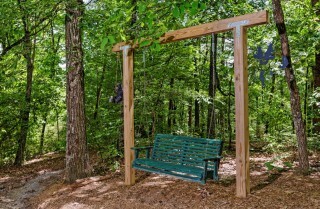 You can look out over the deck at the swing that sits peacefully amongst the trees. 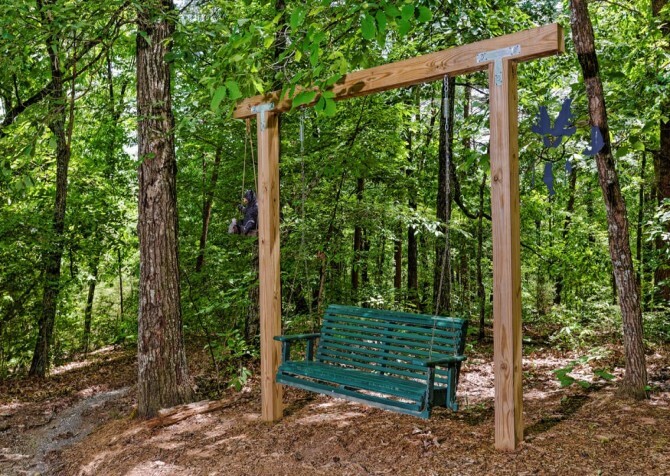 Just imagine a lovely Smoky Mountain afternoon on the swing as you read a book, have a glass of wine, or sit with that special someone. 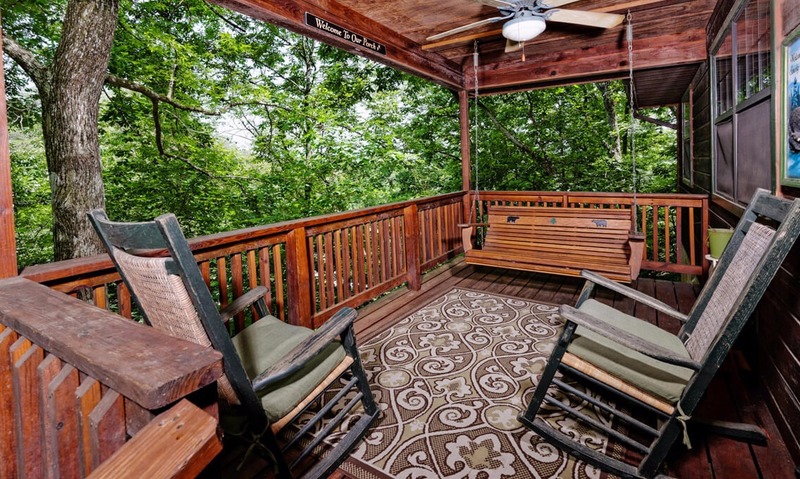 On the covered deck you'll find another porch swing (with bear motif), an outdoor rug, and two rocking chairs. Begin and end your days here with a cup of coffee or a cup of hot chocolate. Designed with comfort and convenience in mind, Bear End features many amenities. Use the high speed wireless to look up area attractions and upcoming events. Many attractions also offer online discounts, so check their websites before heading out. The washer and dryer are nice for longer stays, and the DVD player is great if you want to bring your own movies. Bear End is also pet friendly, so you can bring along your four-legged friends! The outdoor spaces will be great for pets – you won't have to go far to let them get some outdoor exercise. Get the thrill of skydiving in a wind tunnel on the Parkway! Flyaway Indoor Skydiving offers the experience of a lifetime in a safe environment for kids and adults! Step through the giant jukebox into an arcade filled with new and classic games. Then head outside to drive go karts on the fastest track in town! A high-energy show featuring country songs from yesterday and today, the show at Country Tonite is entertaining and funny for the whole family! Along with their regular shows, they bring in big names in country music with their celebrity concert series. "My wife and I have stayed in bear end cabin four times in the past three years. We love this cabin, it is close enough to the things we like to do but far enough away that we are not bothered by noise. 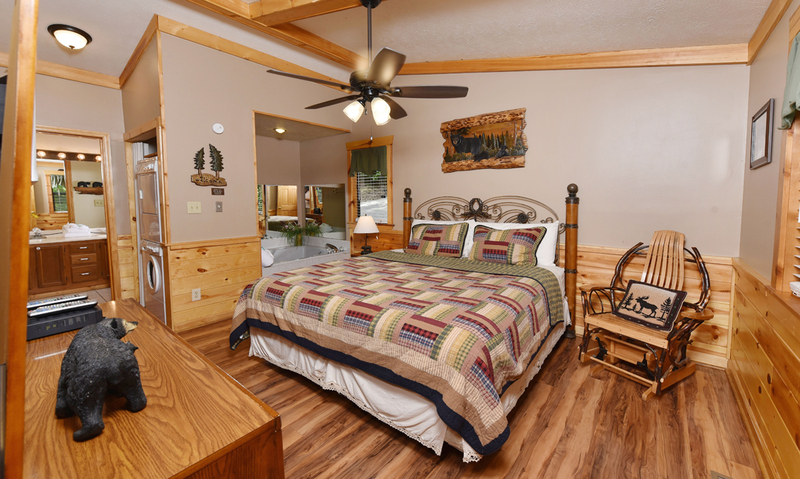 our experience…"
"My wife and I have stayed in bear end cabin four times in the past three years. We love this cabin, it is close enough to the things we like to do but far enough away that we are not bothered by noise. our experience with cabins for you has been very good any issues that we encountered were dealt with quickly and to our complete satisfaction"
It's a joy to hear how much you have enjoyed your stays with us at Bear End! We look forward to serving you for many years to come. Thank you for the great review! "Tv, cable and dvd player did not work, probably we just could not figure out. Opted not to call for instruction because the peace and quiet was wonderful. Loved everything else. 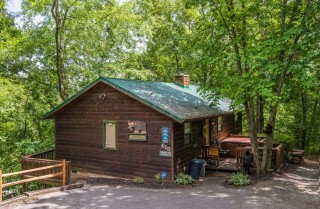 Planning to come back to this cabin." Thank you so much for the wonderful review and taking time to leave us feedback. 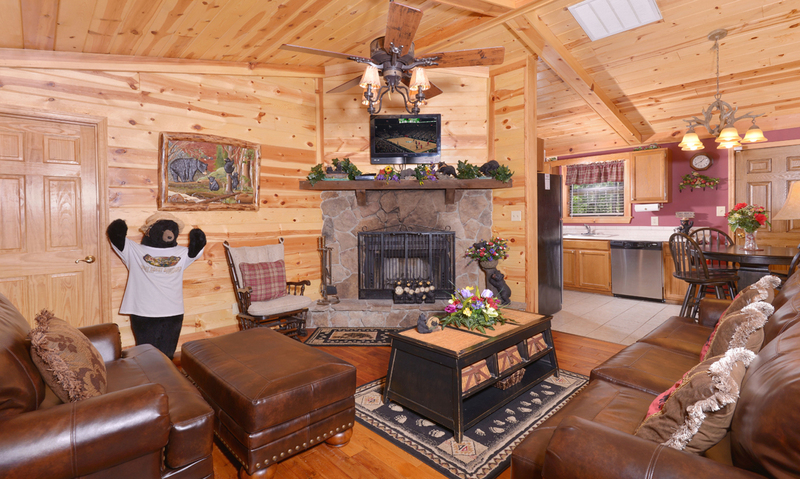 We are excited to hear you are enjoying your stay with us, and even more thrilled that you are enjoying Bear End! 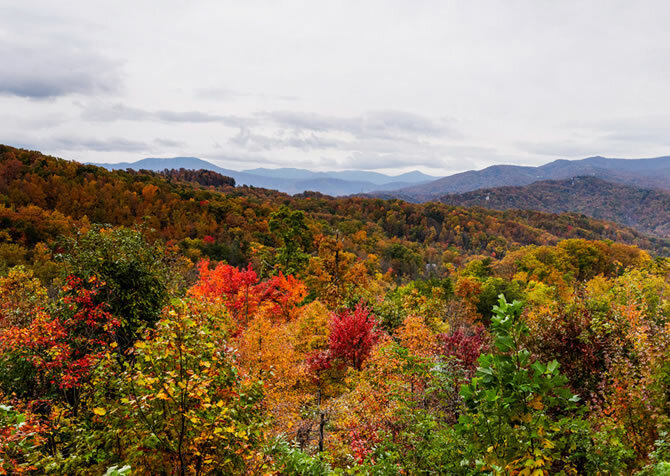 Sometimes the peace and quiet that the Smokies offer is priceless, and we are happy that you are taking advantage of it. However, if you need assistance at all with the TV, please let us know, we are always here to help!